Although the Raspberry Pi has grabbed the most headlines as a tiny, ultra-inexpensive, pocketable computer running an open source operating system, it's actually only one of many tiny LInux computers being heralded as part of a new "Linux punk ethic." 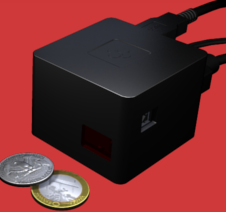 We've written about a number of other miniscule computers that run Android and Linux here. Now, there is a pretty cool looking $45 cube computer that runs Android and Linux, shown here, called the CuBox-i1. This thing looks like it could gain an audience.